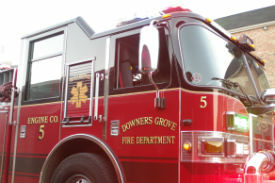 The Village has received notification that the Downers Grove Fire Department now ranks in the top 1.5% of departments nationwide for fire protection effectiveness. The ratings are issued by the Insurance Service Office (ISO) and used to set residential and business insurance premium rates. Property owners in communities with good ISO ratings, like Downers Grove, benefit from lower insurance rates. A community's rating depends on the effectiveness of emergency dispatching; water supply, including inspection and testing of hydrants; available water and the theoretical amount of water needed for fire suppression purpose; and the fire department's training, staffing, equipment and community risk reduction. ISO is an independent company that serves insurance companies, communities, fire departments, insurance regulators, and others by providing information about risk. On a 1 to 10 Public Protection Classification scale, with Class 1 representing exemplary fire protection, the Downers Grove Fire Department received a Class 2 rating improving from Class 3. There are only 750 Class 2 departments nationwide. Based on a study by ISO, the average savings for a commercial property located in a community with a Class 4 rating as opposed to a Class 3 rating is $188 annually, and the difference in premiums going from Class 3 to a Class 2 is a $567 savings.